The SDGs are a design brief for the 21st century. 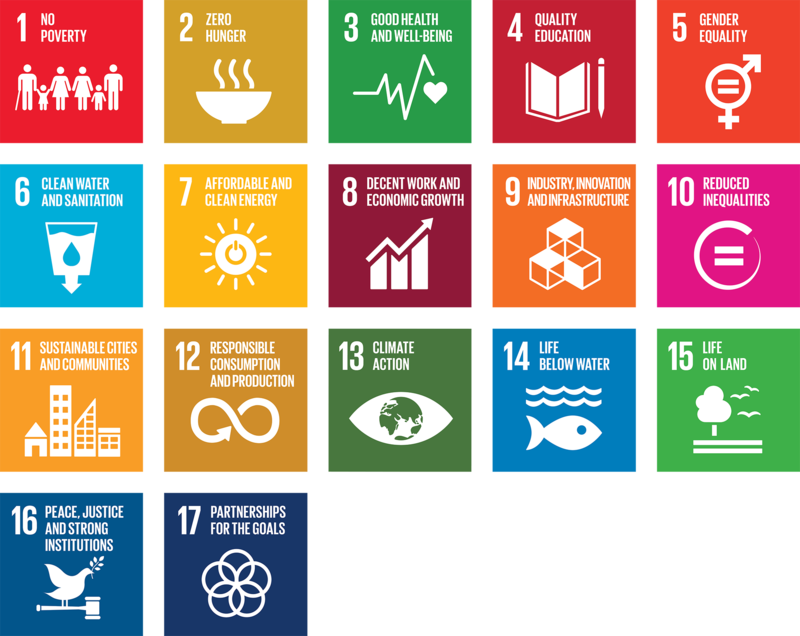 On 25 September 2015, when the 193 Member States of the United Nations approved the 2030 Agenda and the 17 Sustainable Development Goals, (SDGs) they also created the world’s most demanding design brief. /The SDGs are “universal”: this means they apply to every nation, every sector, every business, every profession, including design and architecture. /The SDGs are about “integration”: this means they demand a new emphasis on a systemic approach that does not sacrifice environmental and social considerations to economic gain, but rather seeks for true synergies and solutions that benefit people, nature, and prosperity. /Finally, the SDGs are about “transformation”: this means they challenge us to rethink the way we live, to rebuild all the systems that are degrading ecological and human health — and to make our world sustainable. /In sum, the SDGs are the ultimate design and architecture challenge: how do we create, and recreate, a world that achieves all 17 of the visionary goals that have now been agreed to by all the world’s nations? And how do we achieve this by the year 2030? The designers, architects, and creative professionals of the world have been handed a special and enormous responsibility, given to them by the 193 heads of state. They must imagine and bring to life the design elements of a new, sustainable world — quickly. How can this design contribute to the goal of ending poverty in all its forms, everywhere? How can this design contribute to ending hunger and encouraging the transition to sustainable agriculture? How can this design help ensure healthy lives and well-being for all at all ages? How can this design support quality education and lifelong learning? How can this design advance gender equality and the empowerment of women and girls? How can this design help ensure the sustainable management of water and universal access to sanitation? How can this design contribute to a sustainable energy transition? How can this design promote decent work for all? How can this design advance sustainable industrialization and innovation, especially in those places that do not have access to modern industry? How can this design help to reduce inequality within and among countries? How can this design make our cities more inclusive, safe, resilient, and sustainable? How can this design transform production and consumption patterns, to make them more sustainable? How can this design be part of the urgent action that is needed to combat climate change and its impacts? How can this design be part of caring for our oceans and seas? How can this design help to protect and restore ecosystems and preserve biodiversity? How can this design contribute to the development peaceful, inclusive, and just societies? How can this design advance the global partnership needed to achieve all of these goals? By signing the Oslo Manifesto you make a commitment to bringing a sense of caring for the whole world to every design project you undertake, as well as to the process of lifelong learning about the way design impacts our world, its lifeforms, and its systems. Individual, organization, company or group? I give Oslo Manifesto permission to publish my name, organization, and action statement on oslomanifesto.org and social media for promotional purposes. Oslo Manifesto will not publish or share any contact information with third parties. Ensuring that university students that I teach in my interdisciplinary project program understand the impact of their design decisions and strive to contribute to equitable and environmentally sustainable solutions to challenges faced by our communities. Writing a book about design consciousness - the consciousness that emerged in us over 2 million years of evolution to shape our technologies to fit our humanity: mind, body and spirit. This manifesto is an expression of that consciousness and its principals need to enter the cultural mainstream. To consider sustainability in the design work and leadership I perform. Designers CAN save the world with a poster. To continue to use design as a tool for the moral obligations we have as designers to speak for the people through our creative pursuits and solution-making. Continue to establish traditional woodwork as they knew how to do. As a designer I believe I have a moral responsibility to make the world a better place. I am lucky enough to have opportunities that allow me to affect the lives of many people, and I choose to do my best to improve their lives, in whatever form my work may take. I will continue to do so throughout my professional career, and I will now be more mindful of the points laid out in The Oslo Manifesto. I will use my influence to move creative consultants towards a "silent revolution". This means affecting our clients in a sustainable direction, even when this is not the main objective of our projects. We will start measuring and market effects both related to the projects' original objectives, and the sustainability goals. Make it significantly easier to own and operate an electric or hybrid car. Our world has for far too long been subjected to an economic system of discounts. Irreversal discounts on human and natural capital, in the name of profit. With the SDG's the world announced that this has to stop. The SDG's lead the way and the worlds cities will decide if we will be successfull or not. So my questions to you is, is your city designed for you and our planet, or are you and our planet designed for your city? If not, change it! I will use the reformulated goals in my process, involve my partners/clients in this as early as possible and and take a proactive role in communicating aspects of all my work/work i am involved in in relation to the SDG`s. Design for a better world . Stop greed and start living as one world, one nation and as part of a common purpose. creating and inspiring more impact, less footprint. I am committed to contribute to advancing the awareness, know-how, ambitions, and overall performance among fashion, apparel and textile companies worldwide in the area of sustainability and circularity, through consultative, innovative and research-oriented work via my company Green Strategy, my online platform "circularfashion.com" and my professional network Circular Fashion Network, in a transparent, inclusive and responsible manner. I commit to designing and implementing social impact programs that address inequality through systems, policy and education in the Asia Pacific Region. Considering and putting to clients the manifesto at the start of every architecture project. It will help bring clients a greater awareness of how their build can benefit not just themselves but the greater good. As strategy architects we work primarily on Design in Government and institutional design. We work on designing "architectures" (organizational structures, processes, etc.) for cross-silo and cross-sector collaboration as well as helping to create an appropriate mindset. In our work we focus on integrated smart-city governance arrangements to serve the SDGs at all levels of government, the private- and non-profit-sector. Tell your friends you signed the #OsloManifesto!